You may have seen the AddThis buttons on blogs at some point while surfing the web. It’s a simple, free widget blog owners can add to their site that shows a number of bookmarking options at the end of a blog post (there’s also a feed reader widget for easy RSS subscriptions). Readers can bookmark the post on Digg, Del.icio.us, Stumbleupon, Google Bookmarks, Bluedot and other services with a single click. As an example, we’ve added an AddThis button to the end of this post. The service launched in October 2006 and announced that the widget was being served over 1 million times per day last month. Tomorrow they’ll announce that they’ve reached the 2 million milestone. If you’re interested in adding the AddThis widget to your site, the customization tool is here. AddThis is gathering some very interesting data that can form the core of a business model now that they have fairly deep penetration. 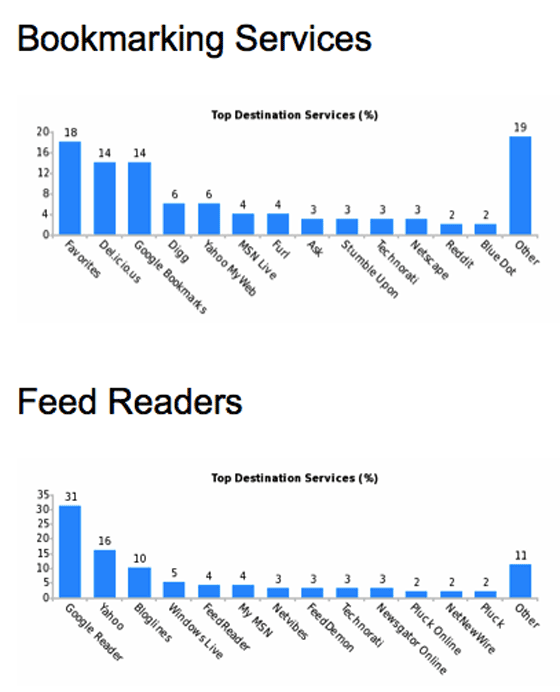 They’re releasing some of this data tomorrow – showing the top bookmarking services and feed readers where their users store data (see the graphs below). Given that AddThis also sees what stories people are bookmarking, it wouldn’t be hard to imagine other things they could do with all of this data. The top bookmarking services, after the browser feature itself (“favorites”) are del.icio.us and Google Bookmarks, followed by Digg and Yahoo My Web. No surprises there. The top feed reader by a large margin is the much improved Google Reader, which is more popular than Yahoo and Bloglines combined. I am surprised at that – Recent Feedburner data suggested Google Reader was doing very well, but not as well as the AddThis data suggests.